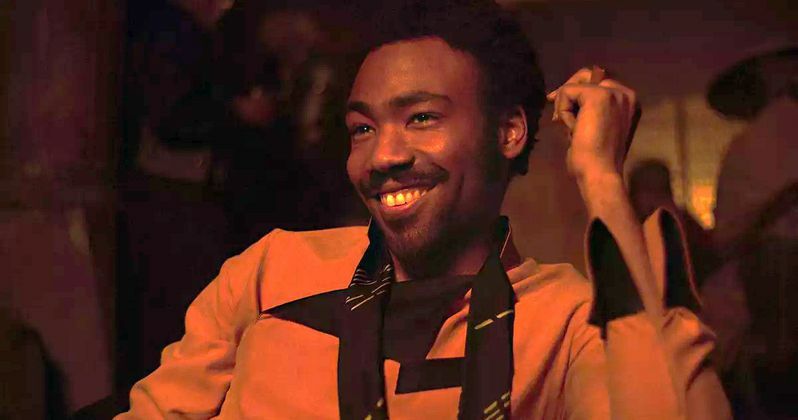 Ever since Solo was announced, and it was confirmed that the movie will feature a young Lando Calrissian, fans have been wondering if one particular scene will be featured in the movie, and now we have confirmation that it is in the movie. Disney took to the stage at CinemaCon earlier today, where they showcased a scene from Solo: A Star Wars Story that features the first meeting between Han Solo (Alden Ehrenreich) and Lando Calrissian (Donald Glover). If you don't want to know what happens in this scene, and want to avoid any SPOILERS, stop reading now. As you may have guessed, the scene shown at CinemaCon shows the all-important game of Sabcc, where Han ends up winning the Millennium Falcon from Lando. The clip begins with Qi'ra (Emilia Clarke), leading Han Solo and Chewbacca (Joonas Suotamo) into a cantina on a snowy planet. Qi'ra then starts boasting about how the man he's about to meet, Lando Calrissian, won his own ship, the Millennium Falcon, by playing a game of Sabacc, although Han proves to be quite the card player himself. The clip shows Han winning hand after hand, when Calrissian ultimately bets the Millennium Falcon. Despite reshoots that lasted until mid-October, due to the firing of original directors Phil Lord and Chris Miller, who were ironically at CinemaCon yesterday to showcase Sony's Spider-Man: Into the Spider-Verse, Disney and LucasFilm still held onto the original release date of May 25, 2018, which marks the 41st anniversary of the first Star Wars movie, A New Hope. New director Ron Howard revealed over the weekend that post-production has wrapped, with a month to spare before the release date. Given the magnitude of the reshoots, where Howard reportedly scrapped almost all of the four months of footage shot by Lord and Miller, Howard's feat is certainly impressive. Solo: A Star Wars Story will have the Memorial Day holiday weekend to itself as the only movie debuting in wide release over the long weekend. Alden Ehrenreich also recently revealed that he has a three-picture deal to play Han Solo, so it's possible we could be getting a Han Solo trilogy, although that would likely depend on how Solo: A Star Wars Story performs at the box office. Head on over to Deadline for their report on the footage that was shown at CinemaCon.